Oakwood helps put families back together. Call 866-443-6259 to make an appointment. We can help you navigate family and teen crises. We offer professional licensed counseling and therapy to teens, parents and families. Let us help your family see the potential for a better future together. It’s no accident we choose comfy casual offices. Our goal is to provide a home away from home: a safe harbor for you and your family to talk openly and honestly with our professional therapists and counselors. It’s never too late to plant a new seed. Take the first step to growing a healthy family dynamic. We can provide the tools to help your teen through adolescence. We teach the skills to ensure your child matures into a healthy well-balanced adult. Now offering a Teen Intensive Outpatient Program and Therapy Services in Orange County at our new location in South Laguna Beach. See address and location map at Contact Us. The Oakwood outpatient treatment programs can offer your family a customized and prescriptive solution to your teen or young adult’s psychological, emotional, risk-taking and behavioral issues. We take a holistic approach in transforming your child’s life and healing your entire family. Our list of services and program options is extensive, but the benefits of treatment at Oakwood are quite simple and powerful. The treatment model used at Oakwood has consistently provided positive and lasting results for depression, anxiety, ADHD, substance abuse, eating disorders, self-harming and at-risk behaviors, self-esteem issues and relationship problems. Today’s young people face stressors and challenges that most of us parents never had to address. Our clinical and support teams have years of training and expertise in treating each specific issue, both therapeutically and compassionately. Our Intensive Outpatient Program (IOP) teaches your child life-skills and coping strategies in their real-world environment, not in a short-term, insulated residential facility. It’s treatment that you can count on for 24/7 support. Treating your teen or young adult in crisis is just the first step in our journey. Our Intensive Outpatient Program allows your child to engage in intensive therapy and life-skills training while remaining fully immersed in home life, school or work. And of course change takes practice over time, so our clinical IOP team provides long-term support, guidance and proven strategies to sustain the therapeutic gains. Our Therapeutic Mentoring Program (TMP) is an option that includes a combination of one-on-one Therapeutic Mentoring, Individual Counseling, Parent Coaching, and Family Counseling, as necessary for your family’s unique needs. This 24/7 program provides additional support and encouragement for your teen or young adult child outside of traditional therapy. With a Therapeutic Mentor and weekly Parent Coaching sessions, we can help get your child and family back on solid ground. We provide practical tools and effective strategies to help you respond to and de-escalate any crisis. In addition, our Individual and Family Counseling components bring both the teen and family members to the table, so all parties can feel supported and heard. Call Oakwood today toll-free at (866) 443-6259 and let’s talk about your family’s needs and how we can help. We don’t just treat your child; we also counsel your entire family and provide the needed tools to promote a harmonious home life. Your child’s psychological, emotional and behavioral challenges have probably been evident in their performance at school or work. And we know it can put incredible strain on your family dynamic. Our goal is to make life better for everyone. To promote healthy relationships and effective ways of dealing with stress and conflict. 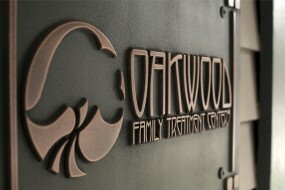 We make sure everyone benefits from treatment at Oakwood. Our programs integrate a myriad of therapies, including individual, group, gender-based, multi-family and parent education groups to name a few. All designed to transform your child’s outlook on life and behavior at home and in the community. There’s no one-size-fits-all treatment here. Our comprehensive assessment phase allows us to create a course of treatment that will address your child’s and your family’s specific issues. At Oakwood, transformation isn’t just possible, it’s inevitable. The programs at Oakwood are as affordable as they are successful. And we will help facilitate your insurance paperwork. The monthly fees for a program at Oakwood are a fraction of the cost to attend most residential programs. And because a residential patient returns from an insulated environment to cope with real-world issues, strides made during treatment are often short-lived, requiring further treatment and different types of support, often requiring additional ongoing costs. That’s why Oakwood’s outpatient model is so well-respected. We deliver successful and sustainable change at a reasonable cost.